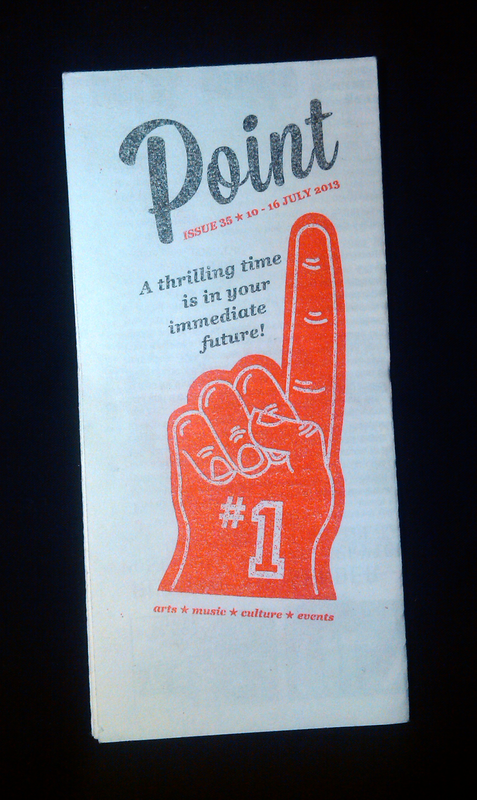 POINT issue#35 first published for the week 10-16.JUL. 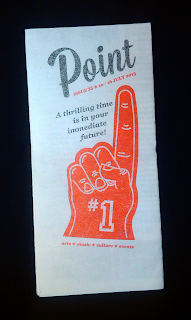 2013 featured a cover designed by Kerry Ann Lee, a reflection from Wellington Correspondent Ronnie-Coco Muse, a piece of short fiction by Hugh Carthew and part II of Malcolm Deans article on the (global) plight of postal services under neo-liberalism. I’m going back to my aunt’s place. Irritable at being disturbed, the gate will flick its flakes of copper rust at my feet as I push it open. Hushed reproaches are spoken by the bamboo leaves: tsk-tsk-tsk will sound the note of tacit reproval. Arriving, I hear the neighbour’s car cough as though in acrid disgust at my return. Yes, I will collect Harry’s things . . . words said in sighing consent. . . They’ve been there for so long . . . I echo my sister’s commiseration, pitying Harry’s portfolio, his slouching schoolbag, the serge shorts of his uniform, for their protracted stay at my aunt’s. The house is fleshy, corporeal: its dense red brickwork blotched with purple veins. It is like skin in which anger or embarrassment surges into visibility. Once, with its stout sides of brick, it might have seemed a bulwark of domesticity. Only now the windows are opaque and train livid eyes upon the neighbours. From behind its walls silence swells, threatening to envelope the garden. A tui sings, desultory, sorrowful. Autumn leaves exhale a generous pungency into my nostrils, symptom of their seasonal mortification. Once, in a school play, the role of parent was assigned to me, “Teenage boys and sleep, I don’t know.” In retrospect, it struck me how such phrases, said with a roguish air, were often on my aunt’s lips. A friend would come around on some evenings and my aunt, loudly forbearing to concern herself with fuss (for such is the privilege of people who are devoted to their homes) would regale her with such remarks. For though my brother was pale, silent, with eyes the same grey shade as catkins, he assumed a very different figure in the eyes of his carer. Her mind warm with wine, her face crimson, she discoursed freely, threatening to “sew his name tag into his underpants. Return them to such and such an address.” In these playful moments her hands flew into the air, as if she were painting an image of her vision, afraid perhaps that we found her words insufficiently vivid. We smiled weakly in response, as if in distant admiration of her wit, but finding such levity beyond us. I am not sure if my brother realised his prominence in these conversational vaudevilles, of which my aunt was the impresario. I imagine him looking with cold wonderment at her inebriated freedom. Through eyes the colour of rinsed sand. Perhaps she scented a kind of criticism in his silences, and found in his diffidence accusations of lewdness of which she was implicitly aware. But his secrecy, the sheath of privacy that was stretched across his face like a balaclava, prohibited even the most tentative inquiry as to his emotions. He would look away from you, as if one glance were enough to scrape his body to nakedness. Timorously he lingered in his bedroom, listening to the thumping pulse of pop music, endlessly replayed. Nipped, uncertain, he had not even the private confidence to peek at strangers: rather the stale tarseal absorbed his sight. Others, to him, were imposing monoliths. Yet now he is simply one denizen in a city in which neither silence nor privacy exist: part of the turbid tide of bodies, daily irrigating the streets. He would be perplexed by these parcels of clothes, as though the sender had forgotten he was now grown up, still recalled him sentimentally, images inaccessible to him. Relics of adolescence, a period for him of stagnation rather than growth. The silence in this neighbourhood lingers, so it has almost the pathetic feel of a derelict place. The air of a person drugged, insensible to any appeal one might make. Life within the houses retreats behind their stiff facades and seethes within, unseen. The gate, scabrous with rust, grates open. In the USA the government has manufactured a financial crisis in order to implement massive cuts to the Postal Service, cuts that will weaken the service and serve as an alibi for privatisation. A law was passed in 2006 mandating the postal service pre-fund the retirement health benefits of its workforce for the next 75 years, before some of its workers are even born! The USPS must send US$5 billion annually, 10% of its entire revenue, to this fund. Unsurprisingly this has pushed the service close to bankruptcy. When this happens it isn't hard to see what whill be demanded next. Cuts to delivery days, mail sorting centres, post office hours, and postal routes are being imposed by the Postmaster General, creating a vicious circle of deteriorating service and declining use. Declining mail volumes due to the internet are cited by management but the Postal Service was financially healthy before the pre-funding of benefits was imosed and the US is seeing a boom in parcel delivery. Canada is also experienceing a stealth privatisation programme with post offices being transferred to private ownership and the deregulation of the international letter market. There is considerable pressure from the right political parties and ideologues to privatise Canada Post in its entirety. In all these countries there is massive opposition to the privatisation agenda. All three have union-backed campaigns to prevent closures, service cuts, and full blown privatisation. In the US, the Community and Postal Workers Coalition is a grassroots attempt to unite union workers from all four postal unions with communities affected by the cuts. There are many fights around the country against the closure of postal facilities going on and postal workers have engaged in hunger strikes in the capital to influence lawmakers. In the UK, the CWU is running the Save Our Royal Mail campaign that has brought together people most likely to be immediately affected by privatisation: the elderly, rurual communities, poor people, etc. In Canada, the Canadian Union of Postal Workers has been actively campaigning for years to prevent the destruction of the public postal service. So what about New Zealand and Dunedin? What will it take to stop closueres and service cuts here? NZ Post has consulted earlier in the year on its proposal to alter the Deed of Service to reduce to three day delivery. On fo the postal Unions, the Engineersing, Printing and Manufacturing Union (EPMU) ran a website where submissions could be made in opposition. You can view the Council of Trade Unions (CTU) submission here. But more will be required than submissions. Experience tells us that management or government often has a predetermined outcome it wants to impose despite overwhelming opposition. To oppose this effectively we need to unite opposition from postal workers in both the EPMU and the Postal Workers Union of Aoteoroa (PWUA), non-union workers, and the communites affected by the cuts, into a flaxroots coaltion that does not shy away from confrontation and direct action. Management decisions regarding closures too often go unchallenged in New Zealand. Redundancies are accepted with unions only trying to get the best deal for its affected members and retraining etc. Managerial prerogatives must be met with workers' prerogatives. Our jobs and public services must be defended. The campaign to save neurological services in Dunedin showed that people will mobilise to stop the closure of essential public services. With local media on its side that campaign was successful. The campaign to stop the closure of the Dunedin Mail Centre would need to link up with others in New Zealand and work together with the clear objective of preventing privatisation and re-establishing a universal public service with a monopoly over delivery in New Zealand. Public good must prevail over private profit.